Choice of Seven different semi-rigid weight loading notices, detailing the procedures for the maintenance of racking structures. Supplied each, please click on the type of notice you require and confirm if any printing required. Tags: weight load notices, weight load signs, racking load signs, racking load notices. 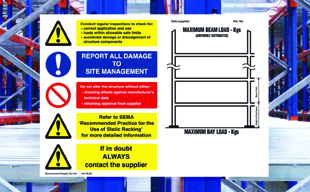 Semi-rigid weight loading notices, detailing the procedures for the maintenance of racking structures. The range covers shelf/pallet racking, cantilever racking, drive-thru racking and mezzanine floors. Our BLS5 is manufactured from tough durable PVC and is in line with the latest Health & Safety recommendations. The sign can be overprinted with your corporate logo, address and contact details. Ordering information – please select your required design and confirm quantity etc. Once the order has been completed we will e-mail you a pdf template for you to confirm data requirements needed for printing.